With the goal of creation of architectural products with the best quality for the people of Vietnam. Company shares architectural Senses longed to the contributions of skilled architects all over the country. Number of employers: 01 people. Location: Tan Thanh – Ba Ria Vung Tau. Time applicants: is hiring …. Understanding the principles of proportion in architecture & interiors. Have a minimum of 1 years experience. Passionate and dedicated to education. We understand the power of collective solidarity, so we built a family ArcSens become large, in which each individual is a jewel to be treasured always, understanding and respect. ArcSens always focused remuneration policy, social welfare and health care for employees, in order to ensure the legitimate rights of workers both physically and mentally. At ArcSens, we always uphold the spirit of learning, the spirit of innovation and creativity. Weekly Saturday is the day: SHARING AND LEARNING of the entire company. We strive to become the elite fighters in their work and in all aspects of life. 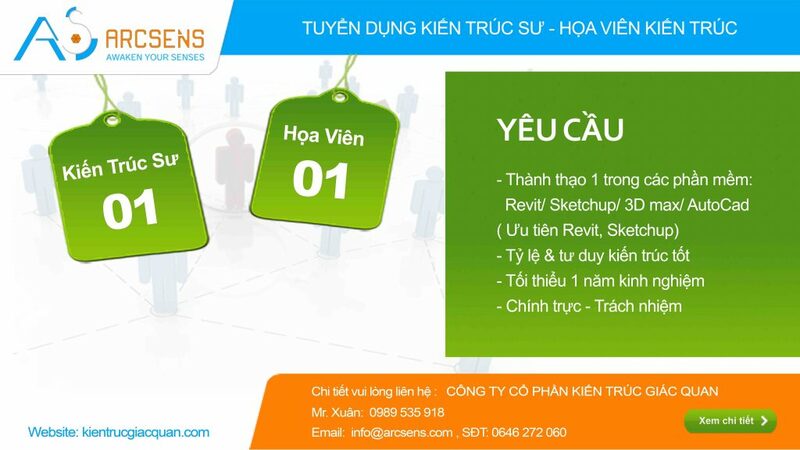 From the platform extremely wonderful, becoming human ArcSens, you will be working in a professional environment, friendly and have the opportunity for professional development in the best way through training programs weekly in the company. + Application for work. + Personal CV. + Photos least 5 works performed. + Degree, certificate, ID card, personal card image. Phone: 02546 272 060 – Office hours.